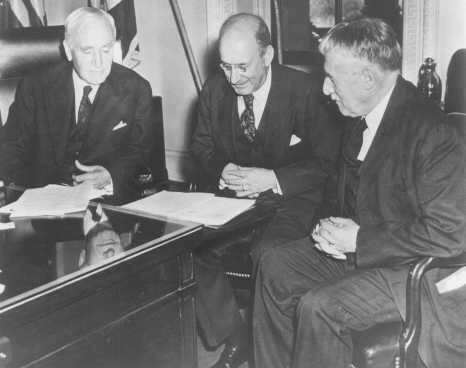 Photo taken in Secretary of State Cordell Hull's office on the occasion of the third meeting of the War Refugee Board. Hull is at the left, Secretary of the Treasury Henry Morgenthau, Jr., is in the center, and Secretary of War Henry L. Stimson is at the right. Washington, DC, United States, March 21, 1944.